You’ve probably heard about the new Federal Trade Commission rule on blogs by now. Bloggers, the feds say, need to be doing a better job of disclosing their conflicts of interest, primarily by revealing whether they’re being paid for reviews, and whether that payment comes in the form of free gear (or, in the piratical industry term, “schwag”). I’d like to be able to preface a post this boring by saying that the lawyers made me do it, but unfortunately, I’m the only lawyer working at MidCurrent presently (though, given this economy, I expect to soon be joined by bat-like legions of my out-of-work compatriots). The basic MidCurrent tribute and booty payment system is pretty simple. I get paid money to write this blog. Once a month, a flatbed backs up to my driveway, makes the little beepy noise, and dumps enough doubloons for me to roll around in, intoning “MidCurrent‘s money!” in my best Cartman voice. That’s the only money that changes hands, however. As far as gear goes, I’ve had a standard rule ever since I started writing product reviews for magazines three or four years ago: if you want it back, just send a return mailing label. Practically speaking, I return just about everything costing more than twenty bucks or so, unless I sweat in it. Would you want a pair of socks used by a greasy blogger returned to your demo pile? I didn’t think so. In all seriousness, we do take our ethical responsibilities seriously here. I have always believed in following the old maxim, “If you can’t say something nice, don’t say anything at all.” If you see a piece of gear reviewed in this blog, you can rest assured that we genuinely believe that it has some redeeming quality or will appeal to some–if maybe not all–anglers. We have never accepted free gear in trade for a review, nor any bribes. Trust me, I’m a lawyer. This post was brought to you by delicious Pabst Blue Ribbon® beer, available only in the finest gas stations nationwide. 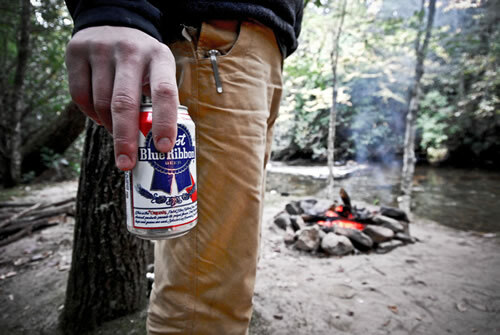 Discuss your deep and abiding love of Pabst Blue Ribbon® beer in the Comments section.